As a collector and curator of contemporary Pacific Art, Ross Searle has long been fascinated by how apparently ‘traditional’ forms of Pacific Art are radically transformed by new techniques, influences and materials. As a collector he has focused this interest on aspects of traditional art and craft including fibre, string bags, body adornment and small scale sculpture; and on how these forms are ‘modernised’ in ways congruent with existing traditions. Ross Searle made his first visit to Papua New Guinea in 1989 and has been active in curating and collecting Pacific Art in the countries of the Melanesian-region including Fiji, New Caledonia, Papua New Guinea, Solomon Islands and Vanuatu. His collections include contemporary textiles, weavings, bilums, tapa, baskets, body decoration, small sculptures, prints and paintings. The exhibition will also include older items of material culture that are fascinating in how adapted materials such as European-made buttons and old coins are used to replace traditional materials. 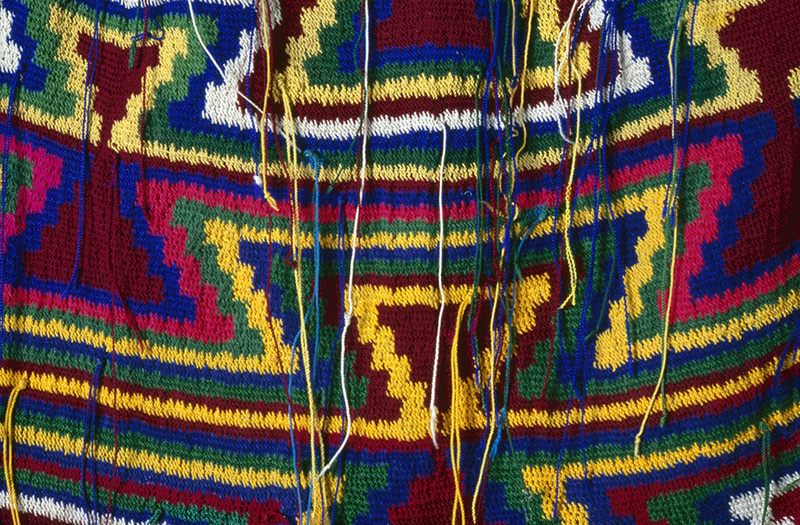 Image: Unknown maker, ‘Kundu drum’ and pattern bilum (detail) n.d. wool and acrylic fibre. Collected from Port Moresby 1991. Searle Collection. Photography by Carl Warner.